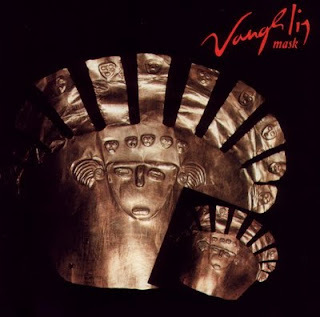 Mask (sometimes The Mask) is a 1985 album by the Greek artist Vangelis. It was the last album he produced while living in London, and also the last he produced for the Polydor label. It is in a somewhat dark mood and classical in style, although it branches into ethnic styles. It reached #69 in the UK album charts. Vangelis plays all instruments, mainly synthesizers, himself. There is choral input on all tracks, and a solo male vocal on the fourth track, but all are uncredited. The choir, as in Vangelis' other choral work, sings seemingly random syllables chosen for their timbre. Similarly, the male tenor vocal of track 4 sings lyrics in a made-up language that resembles Latin. In later interviews it was revealed that the choir is probably the English Chamber Choir and that the male vocalist is Guy Protheroe; the choir also featured on Heaven and Hell (1975). Specific synthesizer patches are Vangelis' strings and brass, a piano (track 3), a marimba-like sequence (track 4), sharp arpeggio sequences (tracks 1 and 5) and a deep mallet percussion (track 5). Timpani and snare drums are the main percussion instruments; both appear to be samples (Emulator I/Emulator II). The album, together with Heaven and Hell and Soil Festivities, forms Vangelis' main classical work. He would return to classical style in the late 1990s, but more in New Age format. Mask is definitely quite experimental (such as the large quart underlying track 3). Lo más raro de este disco es que muy difícil de encontrar en tiendas, más que otros menos "comerciales" de Vangelis.